Is there anything better than the crisp mornings and smells of fall? Football season & fall approaching inspired me to create the a keto chili recipe. This low carb chili is the perfect keto freezer meal. Freeze it in individual servings and enjoy it for lunch or dinner when time is tight. Prior to going on a keto diet, I had created the an amazing chili recipe using some very simple but not often used cooking methods. When we transitioned to a keto diet, I knew I had to modify my prior creation and create the best low carb chili recipe. The taste tests on this were overwhelmingly positive. Furthermore, this low carb chili freezes perfectly. It’s the perfect keto freezer meal. Cook up a big batch of this chili over the weekend and freeze it in various sized portions. A smaller portion gives me some flexibility in how I use the leftovers for a keto dinner or lunch. For example, I love using this low carb chili as a topping for a green salad along with some cheese and sour cream. My husband takes this keto chili to work in the 1.75 cup portion and tops it with cheese and sour cream for a satisfying and filling lunch. Cooking keto allows me to really experiment with flavors & textures. 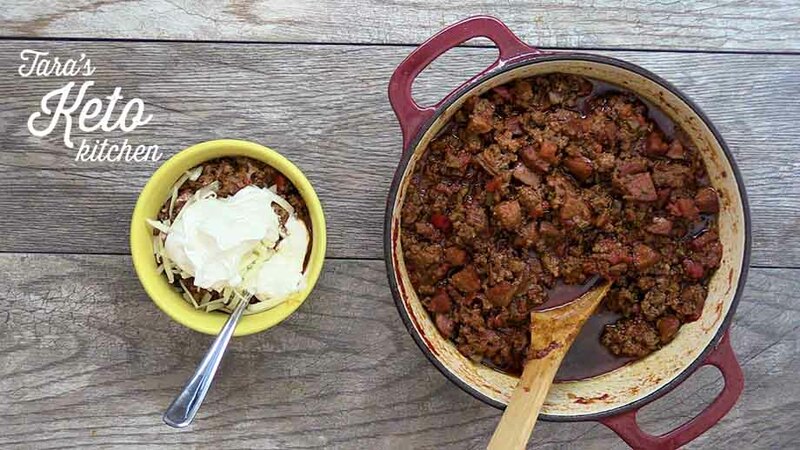 The smoked sausage is what replaces the traditional “chili beans” and gives this keto chili a hearty mouth feel. I’ve diced the smoked sausage into small pieces with this intention in mind. Use a smoked sausage and not raw sausage. The other secret is “blooming” your spices. By simmering your spices in avocado oil you allow the flavors to “bloom”. Browning the meat inside of these bloomed flavors and adding just a little coconut aminos really brings out the meaty flavors in the keto chili. I’ll walk you through how to do all of this in the recipe instructions and video. See my notes below the recipe for more cooking tips. This low carb chili recipe makes approximately 8 servings at 1.75 cups each. If you are being exact with your nutrition, make sure you weight out the meat and divide up the number of servings at the end. This is absolutely the best keto chili on the internet. A few of the techniques I am using here I learned from my obsessive “Americas Test Kitchen” watching. We bloom the spices to bring out the flavor and we brown the ground beef in spices to pull a meatier flavor out. In a medium sized dutch oven or pan, heat ½ cup avocado oil for a few minutes until it shimmers. Now, we will “bloom” our spices. This is a very easy cooking trick that will transform the flavor of this dish exponentially! We’re just going to add all of the ground spices to the avocado oil and cool the spices in the oil for a few minutes. Next, add the chopped onion, red bell pepper, jalapenos and garlic cloves. Simmer for approximately 5 minutes or until the onions begin to turn translucent. Add the diced sausage links and cook for 5 minutes. We’re now ready to brown the beef in all of these amazing flavors. Add half of your ground beef, working in chunks. Use your spoon to chop up the beef into small pieces. Add the Coconut Aminos. Cook for 3-5 minutes and then repeat with the other half of your hamburger. Cook hamburger for an additional 10 minutes or until no pink remains. Finally, we’re ready to add the tomato paste and diced tomatoes. Add these to the simmering pan and stir them in carefully. Simmer your chili for 1-2 hours on low heat. Garnish your completed keto dinner with real sour cream & shredded cheese. Notes: In the winter months when fresh produce isn’t as easy to come by, we used the dried counterparts. This is also a great “cheat” for those of you who don’t enjoy chopping! I fully encourage you to embrace these small cheats to make cooking keto easier! You could further reduce the carb count of this keto chili by cutting the tomato paste and tomatoes by half. The secret to this Keto Chili recipe turning out with wonderful flavors are twofold. First, cook with high quality ingredients. Second, make sure your ingredients are fresh. If you have spices sitting around that have been there for years. Do me a favor. Toss them. Yup. All of them. Then, follow the links below and order high quality spices. I’ve hand-selected this collection of spices for cooking this keto chili recipe– choosing organic when possible. Ordering online is generally the easiest (and least expensive) way to find all the ingredients. If you don’t cook often, consider splitting the spices with a friend. You really should replace your spices every year (or two). This will transform your keto recipes into something truly special. Order the dried versions and substitute based on the conversions that come with each ingredient. This is a trick I use very often during the winter months when my local farmers markets are closed down and organic produce prices skyrocket due to less availability. There’s no shame in shortcuts when you’re cooking! Especially when you’re cooking keto! No, No, No! Don’t just throw it all together in a crockpot! Blooming your spices is a very easy and critical step to this recipe. Watch the video to see just how easy blooming your spices can be. The result is a rich & flavorful chili that you just can’t get by throwing it all together and turning on the crockpot! Use these tips to turn your mediocre keto dinner into something truly envy-worthy! Missing one or two of the spices in the list? No worries– you can mix/switch up the different chili powders and still get great results. Want this keto chili to be a little lower carb? Omit the tomato paste. It packs the biggest carb punch out of all the ingredients. I know that this is a random question but I cannot find another way to contact you. 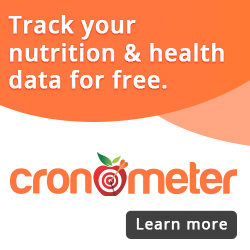 I have a question about the low carb apple crisp recipe. Do you think that I could substitute coconut oil for the butter in the crumb topping for a dairy free version? Also was wondering if you think using zucchini chunks instead of apples would work or will the zucchini be too watery. We are very strict keto and do not eat apples but my husband is really missing apple crisp. Could you please email your response. Thanks so much. I think you meant to say that you “cook” your spices in the oil – not “cool”. Never heard of blooming spices without heat – LOL. Was looking at the nutritional breakdown you have but it doesn’t have a serving size on it or at least not one I can see. I make a similar chili minus the onions and the peppers I use 2 14 oz can diced and 1 28 oz can sauce then I add the 3 different types of chili powders to taste. What is the name of this in My Fitness Pal? It’s not in my fitness pal. You’ll have to set it up as a custom item. I just made this for dinner and I have to say. The name of this chili is spot on. The flavor is incredible. It was quite hard not going back for seconds. Wow. You weren’t kidding about this being the best Keto chili on the internet!